Last week I ran into Gerrit Grünwald (@hansolo_) whilst demoing JMC in the Oracle booth at JFokus. 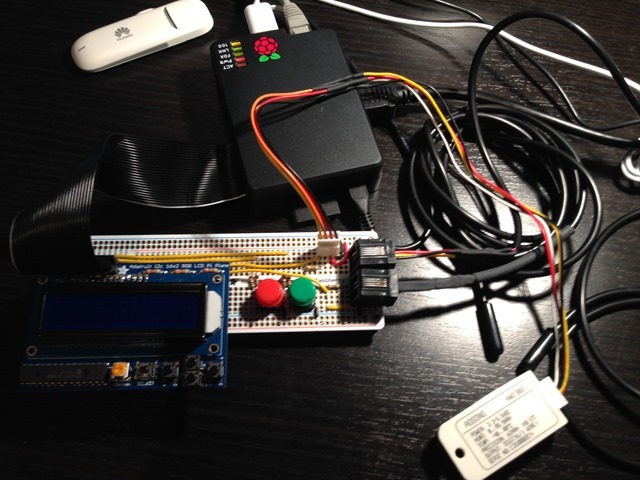 I’d built a little RPi sensor board to have in my summer house, and since there is a lot of interest in the Internet of Things, I thought I’d contribute by showing how easy it is to hook up the JMX Console to one of those things. 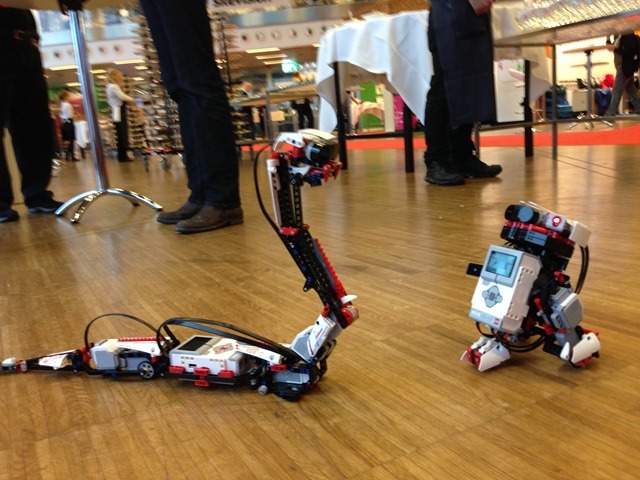 We also had a very neat demo sporting a plug-in for the JMC console for controlling our resident LEGO robot (caught in an intimate moment with another robot in the picture below). 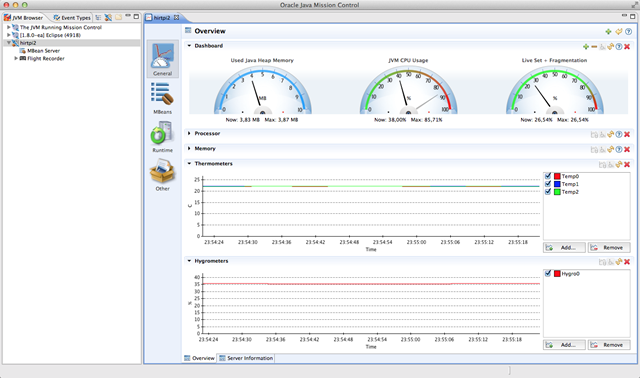 Anyways, Gerrit wanted to know how to extend the JMC JMX Console with custom JavaFX visualization. 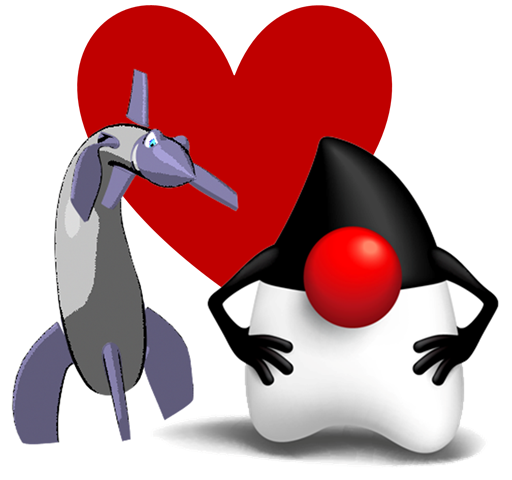 Since the Java FX part will be much easier once JDK 8 and JMC 5.3.0 is out, I’ll leave that for a (not too distant) future blog post. 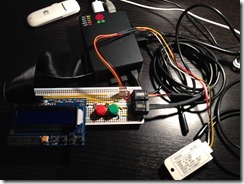 Here is the first step though – how to build your own JMC console plug-in! 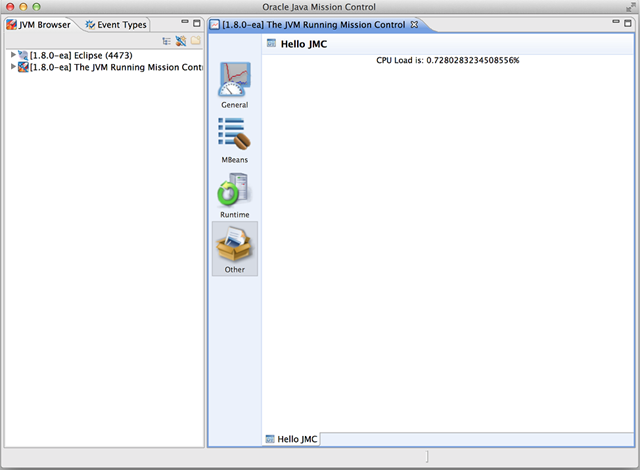 The easiest way to get going is by installing the JMC PDE plug-in into Eclipse. Note: Later releases of Eclipse are pickier about certificate validation – if you run into problems because download.oracle.com maps to akamai hosts, try using http instead of https in the update site URL. 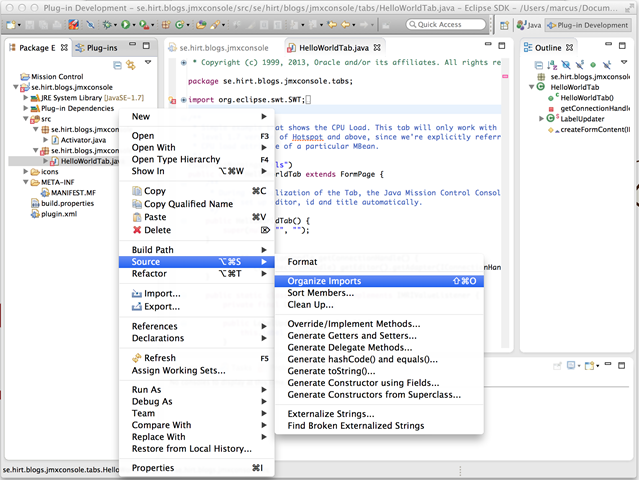 The plug-in to install is the Development/Java Mission Control PDE Integration one. 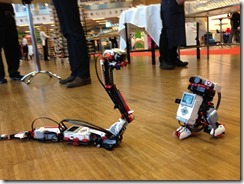 Next you need to set the target platform to your JMC installation. You are now set to start developing your first Mission Control plug-in. Select a Directory for where to put the plug-in and hit Finish. That’s it. You should now have a plug-in jar file. 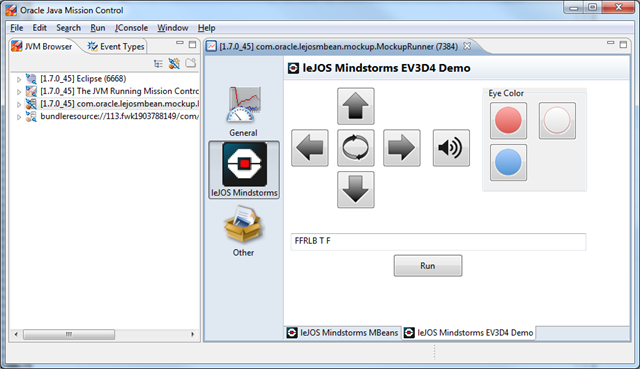 How easy it is to install your plug-in depends on the version of JMC you are using. For 5.3.0 you simply copy the plug-in into the JMC_HOME (i.e. JDK_HOME/lib/missioncontrol) dropins folder. Done! Where <metadatadir> is where you want the metadata published, and <pluginsfolder> is the plug-ins folder where you exported your plug-in. The result in <metadatadir> should be two jars and a plugins folder with your plug-in in it. 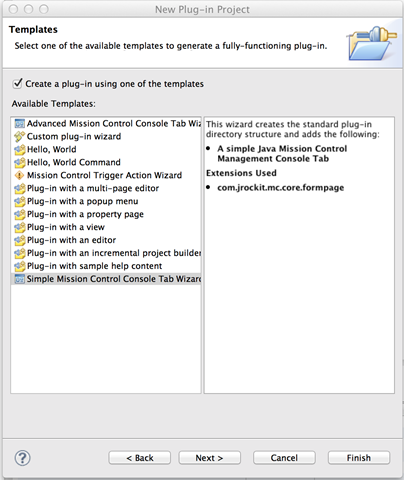 This blog entry described how to create a custom plug-in for the Java Mission Control JMX Console, and how to install the newly created plug-in. The installation process of custom plug-ins is simpler in the upcoming 5.3.0 version of Mission Control. 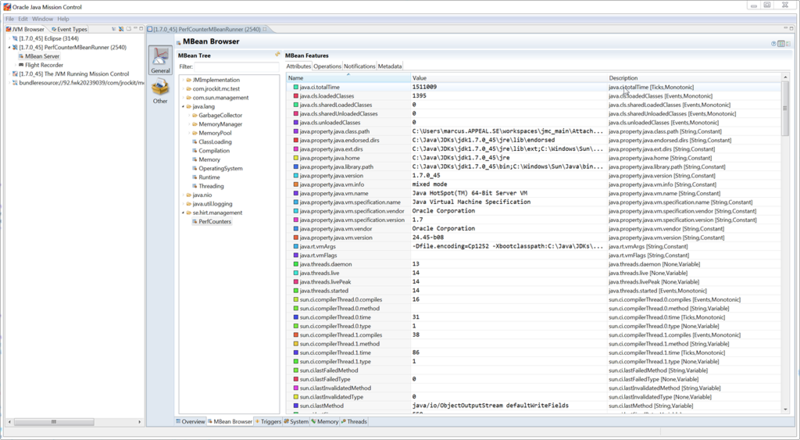 So, in JRockit there was this neat little dynamic MBean from which you could access all the JVM performance counters as attributes. Tonight I ended up in an e-mail thread leading me to think about how to retrieve the HotSpot ones. This is of course all very unsupported, and counter names/content and even the very API is subject to change at any given release. I am providing this information mostly as a reminder to myself. Who knows, someone might find this useful. If you ever used JRockit, you may fondly remember the old jrcmd utility, which now exists in a HotSpot incarnation as jcmd. 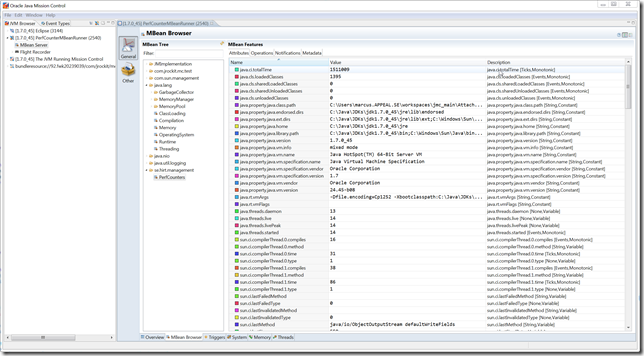 Well, jrcmd had an option, –l, which would list all the the performance counters in the target JVM. The following code will let you implement something similar to the jrcmd –l command. Note that the PerformanceCounter API resides in a package most IDEs will restrict access to. You will need to change your project settings accordingly for the following to compile. Note that you will need the “sun.misc.Perf.getPerf” permission to be able to access the Perf instance when running with a security manager. From here to a fully functional Dynamic MBean, the step is pretty short. // get as many as possible. // Seems this one is not supposed to throw exceptions. // This will not happen – known to be wellformed. Sample code for using the proprietary JVM performance counter API was provided, as well as example code on how to implement a version of the old jrcmd –l command, as well as the old PerformanceCounter MBean of JRockit. Again, these examples are using proprietary APIs that may break at any given release. Use responsibly!